Hi all!! It’s decal time again! Im sure water decal is not sth new to u anymore!! 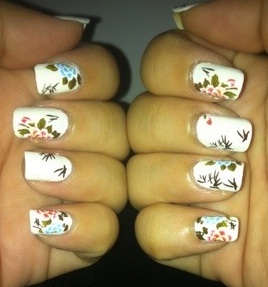 I had previously posted 3 posts about my decal nails.. Now this is the latest one i’d just rec’d last night.. 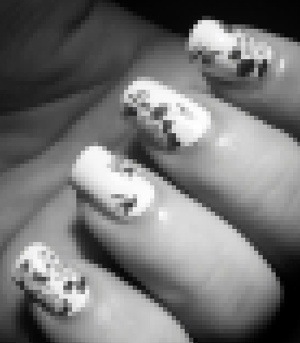 This art took mi slightly more time to complete as I’m not very good in painting my nails white!! 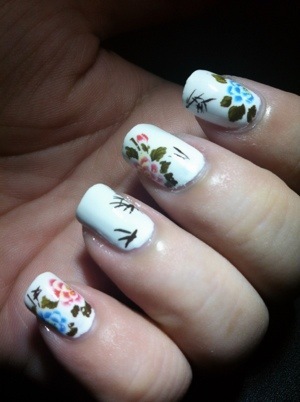 So pardon my very jagged polish work but love the decal design!!! Make a guess what design it is this time…!? 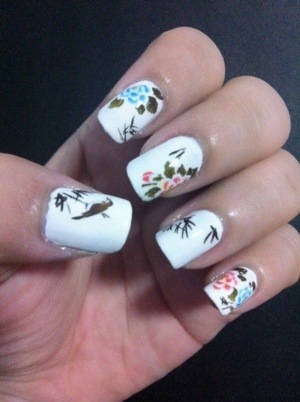 Tada… My Chinese Painting decal from Mei Mei’s Signature!!!! Super happy with this design! And apparently it went out stock not long after I made my purchase.. thank goodness I din ponder another second else I wun get to have another favorite thing in my stash already!!! Pardon, again, for my not very clear photos.. lighting wasnt good, hands shaking, iphone cam resolution wasnt goo enuff.. everything else but not about my fault..! hahahahah!! nah.. just couldnt seems to capture it in the right angle.. So had upload whatever angle i shot to share.. 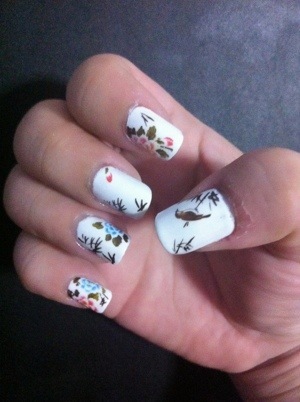 I had trim and cut a bit on the decal cuz some parts are too long to fit onto my nails.. and among all, i really love the birdie~~ AIYA!! 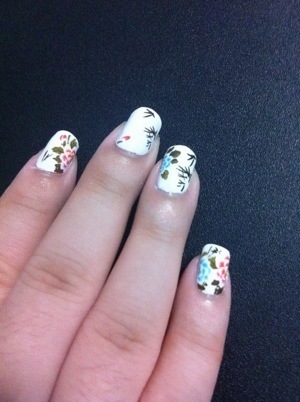 Should have take a pic of the original packaging to show u before it goes onto my nails.. tsk, ok! next time.. i still have some decal in stock..
Now this one is with flash.. so far do you like it?? I’m so loving it.. 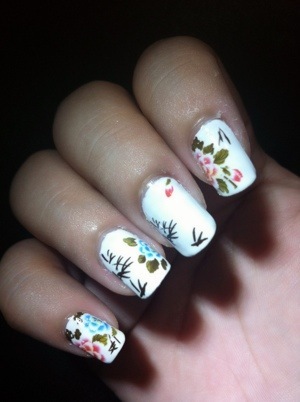 I think every girl out der who love to DIY, should try water decal..! 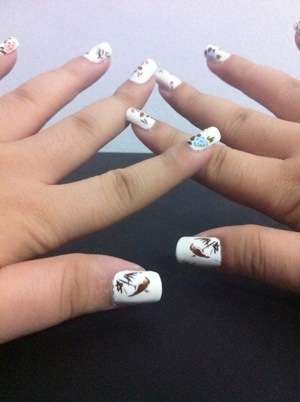 only S$3.50 you can achieve Salon standard!! …. did i just say salon?? erm.. i meant .. shucks! wat do u call a place for mani/pedi?? 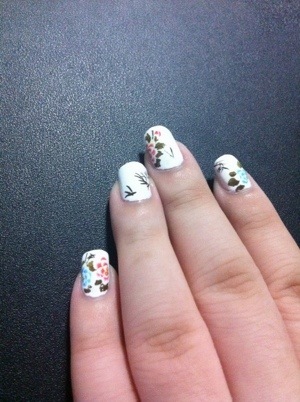 well.. nvm.. i seriously think water decal is e greatest way to design our nails…! Fast, beautiful and efficient!! Even kids can easily do it but parental guidance pls! Because cutting and trimming is needed..
Well Well.. hope you guys like this design like i do too.. See u next time! 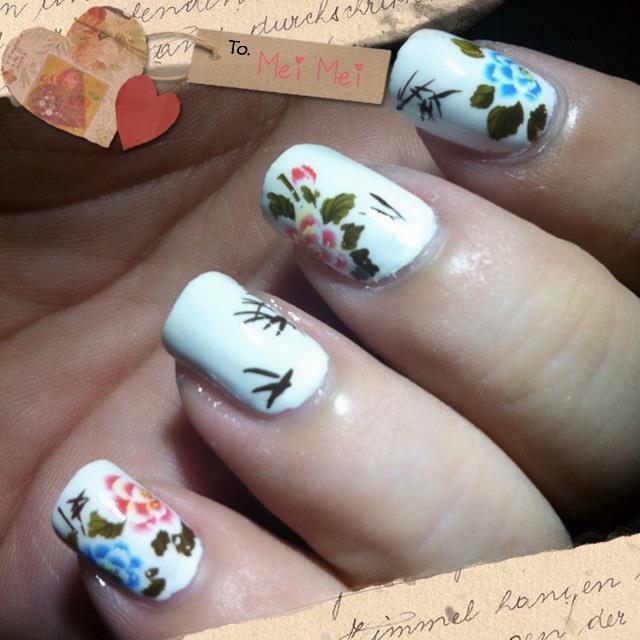 This entry was posted in .China Glaze, 70255 White On White, Nail Accessories, Nail Art and tagged Nail decal, Water decal by Tempted to Love. Bookmark the permalink.